About a year ago I bought this half perishing rose-bush at a discount price from a Garden Nursery Center. I planted it in my garden next to a large Cross that my husband made, hoping that it would be a climbing rose-bush right around the cross. I fertilized it and watered it and gave it special treatment more than the other rose plants I had around it , hoping that it would flourish, but sadly with each passing day this spring it started to die. So in my “got to fix everything mode” I replanted it and gave it less attention hoping that it would either take it’s turn or not. 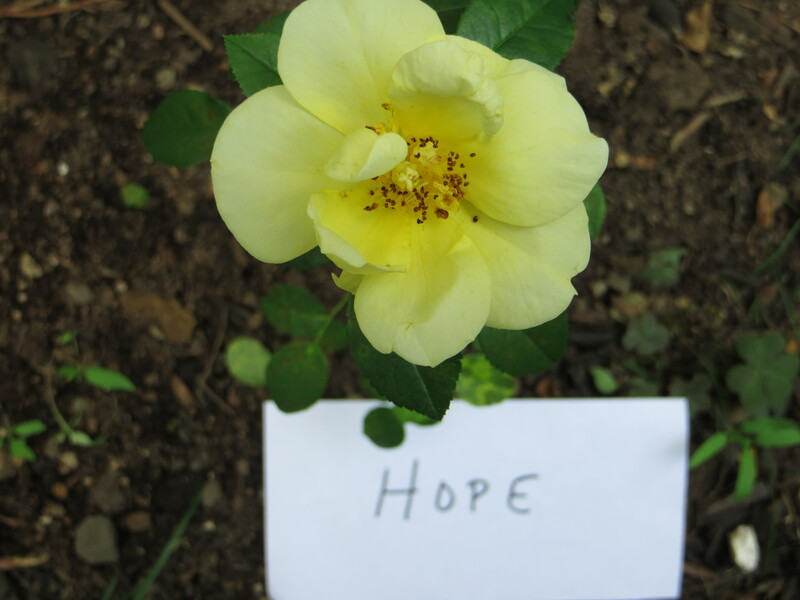 About three days ago, I was passing it by on my way to the garden and saw this miracle, it had grown a new branch and one yellow rose which I now call hope. The reason (there are so many) that I call it that was because just when I think there is no hope, God replants me. He will rise me up and out of situations or bless the ones I am in just to show me there is hope and that He listens to the small things we ask for or think about. So in my writing this to you, if you are down or depressed or even think you can’t get out of something, there is hope through Jesus Christ and that your road ahead is far better with Him as your guide.